Charles Crombie (1880 – 1967) was born in Dumfries, Scotland. He was the third son of Bridget Philadelphia Vince and her husband Scots architect James Crombie. His father was a partner in the Byrne & Crombie, a London architectural practice. This editorial cartoonist grew up in Lambeth, Surrey in the 1880s and 1890s. By 1901 he was working as an artist and sculptor, from his family home at 25 Rumsey Road, Lambeth. He specialized in publication and cartoons illustrations. 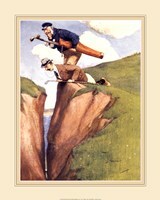 His collection of humorous postcard cartoons was published in 1906 by Perrier, and rapidly became a best-selling series. Some of his similar sporting works followed with equal commercial success. In 1907, Crombie married Helena Wallace in Lambeth and by 1911 the couple was living at Hogarth House, Richmond Upon Thames, Surrey. In 1914, they had their first daughter Irene Crombie. In 1915, leading Bloomsbury Set socialites Virginia and Leonard Woolf bought part of Hogarth House. After the building, they named their hobby business the “Hogarth Press.” Crombie continued to produce illustrations for magazines and books in the United States and United Kingdom throughout the 1920s and 1930s. The artist died in 1967in Hitchin, Hertfordshire aged 86. He left behind a legacy of high quality works of art that has become the admiration of many – both artists and non-artists. Today his art can be seen in several galleries, museums, institution and homes around the world. His art is highly priced by many discerning collectors because they can be used to decorate all spaces and are also inspiring.